The centerpiece of the Planetarium is a tilted semi-dome screen nearly 15 meters in diameter, supported by high resolution 3D digital projectors. 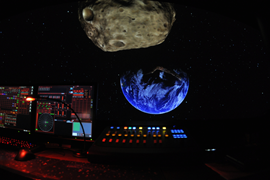 The Planetarium has around 127 seats equipped with interactive controls. Wearing special glasses, the audience can see 3D images projected onto the screen. Its powerful database, coupled with the amazing projection effects, can take viewers on a journey traveling freely into space. 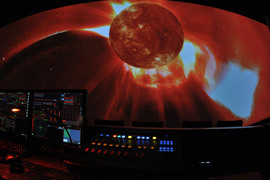 The system can also show digital Dome films, thus making the Planetarium a multi-functional Dome theater. The tilted dome screen, 15.24 metres in diameter, houses 127 seats and 4 wheelchair spaces. 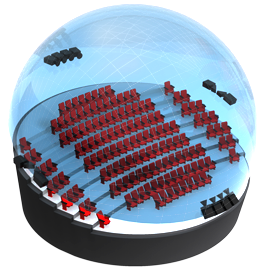 The world’s first digital dome theatre system that can project stereoscopic images with resolution up to 8000 x 8000 pixels. The system consists of 12 ultra high resolution digital projectors and 12 powerful graphic computers in synchronization producing super high definition 3D images. With Interference Filter Technology (Infitec), the state-of-the-art 3D glasses can recreate the most vivid 3D images in true colour. 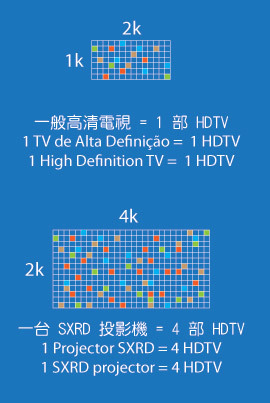 Narrations in Cantonese, Mandarin /Putonghua, Portuguese and English are available through headphones for recorded programmes. 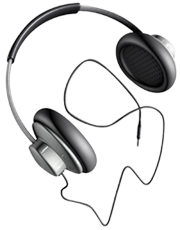 Visitors can also use their personal headphones with 3.5mm jack. 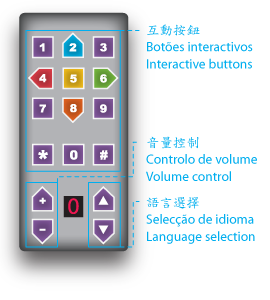 16 buttons for language selection, interactive learning, questions and answers, voting or statistical applications. 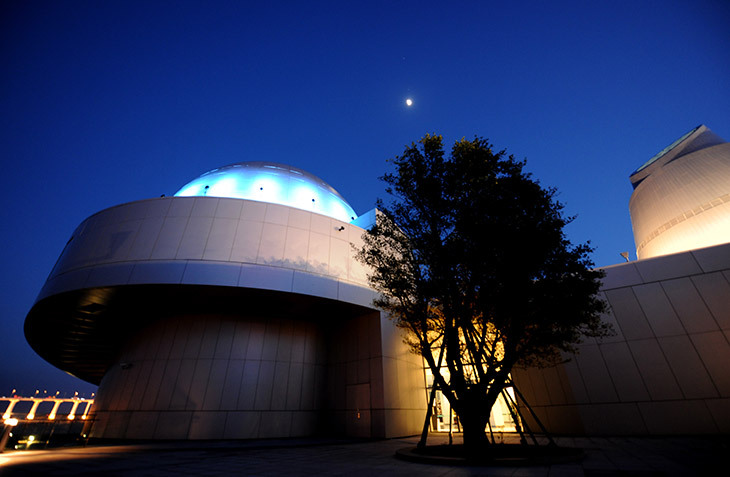 The projection system of the Planetarium can play back 2D and 3D shows produced in “fulldome” and traditional film format.Any 2D and 3D audio-visual materials with sufficient resolution that can be converted to fulldome formats can be shown in this theatre. 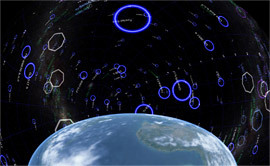 The 2D/3D Sky Shows of the Planetarium are created using the “DigitalSky Dark Matter” system. The system navigators can take the audience on journeys through time and space in the Universe. Stellar objects in and beyond our Solar System can be observed in 3D, with additional visualization such as orbital paths and coordinates. Positional information of stellar objects in the “Digital Universe” data base is jointly created by National Aeronautics and Space Administration, European Space Agency and American Museum of Natural History. The database comprises research data of the world’s most notable scientific societies. It is considered to be the most comprehensive and accurate 3D cosmic map ever presented.